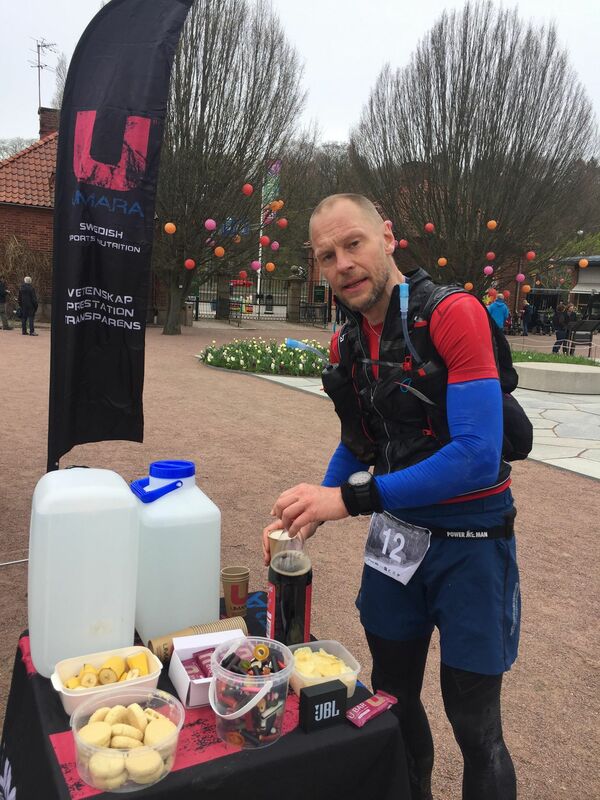 At the inaugural Aktivitus Trail Race, organized by Tomas Amneskog in 2017, no one successfully completed the course of 100 miles around Gothenburg with over 3,000 meters ascent. This year, the runners on the starting line were determined that the same thing wouldn’t happen in 2018. After last year’s premiere, where the course defeated all participants, interest grew throughout the following year for this new race. As the race is an UTMB qualifier, with a maximum of 6 ITRA points, there was also interest from outside of Sweden. Of the 28 registered runners, 22 cross the starting line. 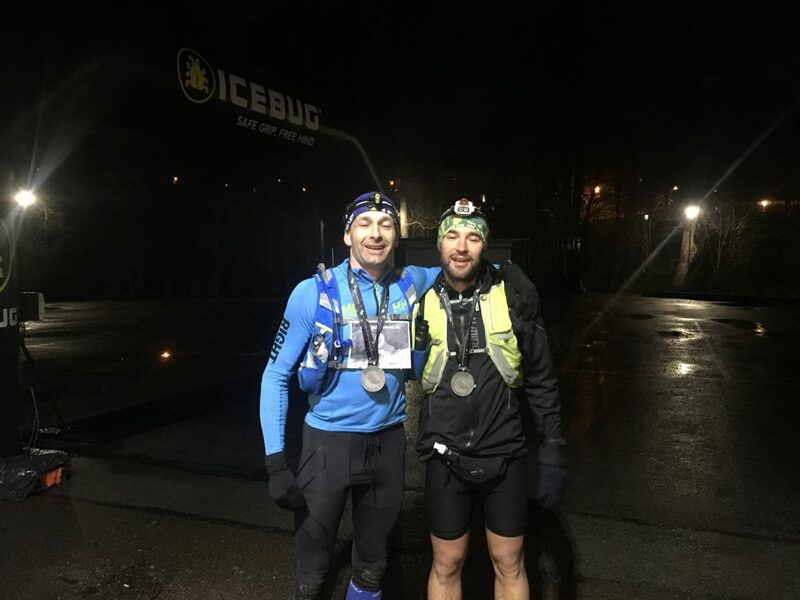 The start and finish for the 100-mile journey was situated at Icebug’s headquarters in Jonsered, just outside of Gothenburg. The competition kicked off at 05:00 on Saturday morning (28/04) to the uplifting tones of Andrea Bocelli and Sarah Brightman’s version of “Time to say goodbye”. The track started out along the Bohusleden hiking trail for 13km to the first aid station, where Andreas Pettersson came through as the lead runner in 1h27m, followed closely Niclas Gällentoft, Toomas Unt and Fredrik Larsson. The course continued along small wooded paths up to the stunning Vättlefjäll nature reserve, and followed the Vättlefjäll trail to the second aid station at Dammekärr. 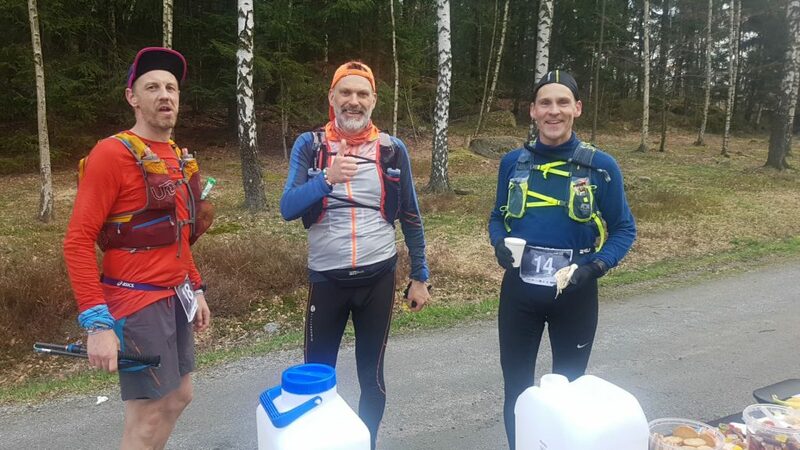 Andreas was still in the lead after 28km, reaching the checkpoint at 3h02m13, with Toomas thirty seconds behind, and Fredrik and Niclas reaching the CP two, and four minutes later. A tight lead pack at this point. The Ultra Trail route follows the Vättlefjäll trail back towards Bohus, where it reconnects with the Bohusleden trail in the direction of Fontin in Kungälv, with a loop around Bohus Fortress. At the Fontin aid station after 40km, the runners’ positions were unchanged, with Andreas in the lead with 4h08m48. After this non-technical/ runner-friendly section, Andreas now lay 5m30 ahead of Toomas and Fredrik. From CP3 at Kungälv, the nature of the course changes slightly as it passes through the relatively unknown forests of northern Hisingen, Sweden’s fifth-largest island. This also happens to be the Race Director (and course designer)’s backyard, consisting of small forest paths in hilly terrain. The rainfall in the days preceding the race left the ground soaked and muddy, reducing the pace as a result during this longer 25km stretch to the next aid station, which was literally in the Race Director’s backyard. 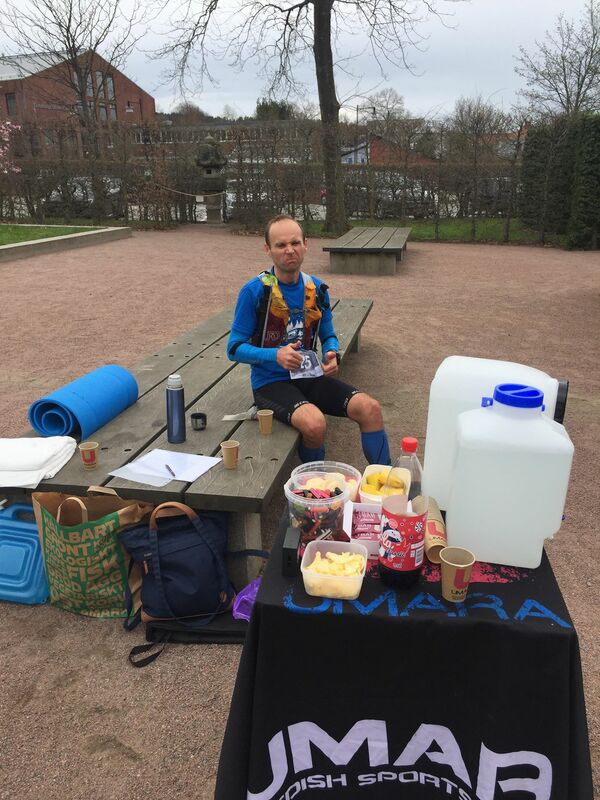 The entire Amneskog family took care of the runners at CP4 in Bönered after 65km, where Andreas, who passed through in 7h06m00, was now only 27 seconds ahead of Fredrik. Toomas had dropped a position and a few more minutes, and reach the aid station 8m42 later. From here, the 161k Ultra Trail runners were joined by the runners from the 61k Ultra Race, winding along forest trails down to the radiomast at Brunnsbo before turning towards CP5 at the halfway mark, 82km (50 miles), in Hisings Park in Tuve, where the runners had access to their dropbags. 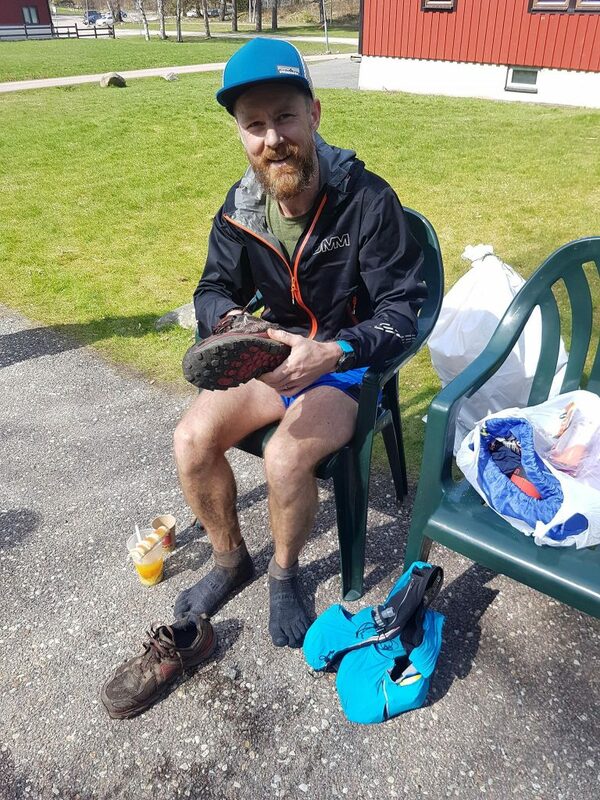 Fredrik had picked up the pace on the trails of Hisingen and reached the halfway aid station at 9h03m55, a full 6 minutes ahead of Andreas and 13 before Toomas. The lead runners set themselves apart from this point, with Fredrik, Andreas and Toomas in a class by themselves; the fourth runner, Andreas Simonsson passed 53 minutes later at 09:57:07 and maintained this constellation for the rest of the competition. 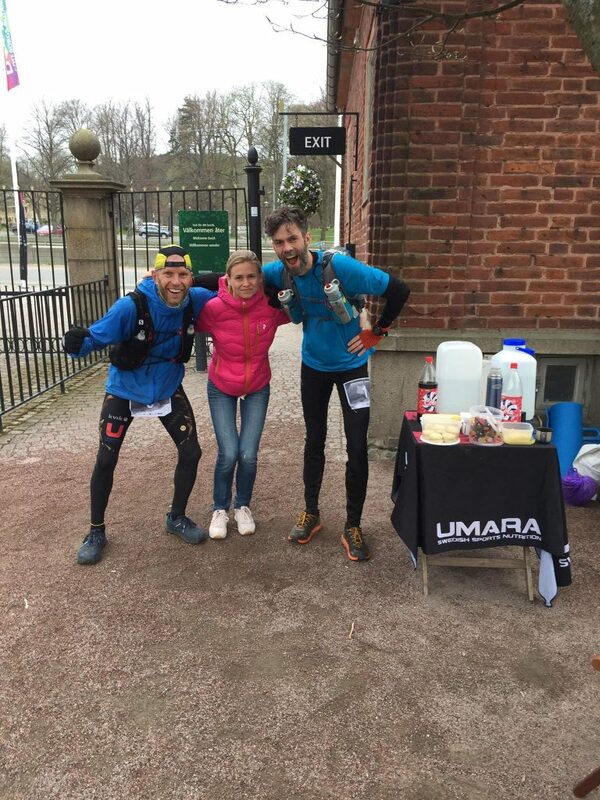 From Tuve, the runners followed the route from Hisings Park to Svart Mosse (Black Bog), across the Göta river on Älvsborg Bridge, through Slottskogen (Castle Forest) and on to the 6th aid station at the Botanical Garden after 100km. Fredrik checked in to CP6 after 11h08m, with a 14-minute lead over Andreas, and 19 minutes ahead of Toomas. CP6 was the end of the race for Dan Gustafsson, after a valiant final push from the checkpoint in Tuve. Dan succeeded in doubling his own distance record, having previously run marathon distance (42.2km) at most. 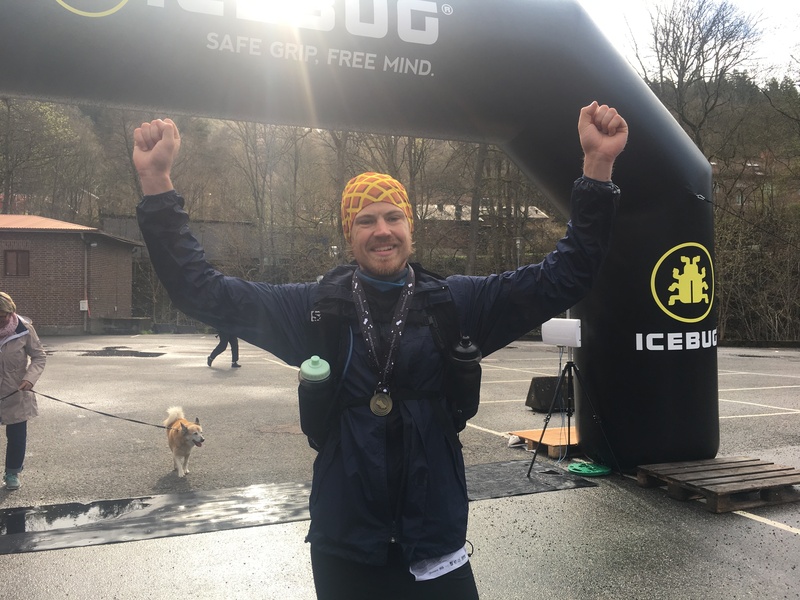 With a healthy dose of grit, support and encouragement from other runners and the volunteers at the aid stations along the way, Dan went out in style, pleased with what he had accomplished, and still smiling. Great job, Dan! For the participants who passed through the aid station at the Botanical Gardens one of the longest stages was waiting, and it had begun to rain. Of the 22 runners who started in the morning, 9 had opted to DNF by this point. However, the remaining 13 stayed on track for the entire length of the tough second half of the race. The course continued through two nature reserves Änggårdsbergen and Sandsjöbacka, taking the runners past the Sisjön lake. During this section, Toomas had succeeded in passing Andreas to move in to second place, and by the time they reached CP7 at the Tulebo aid station, he had reduced Fredrik’s lead to a nail-biting 2 minutes. 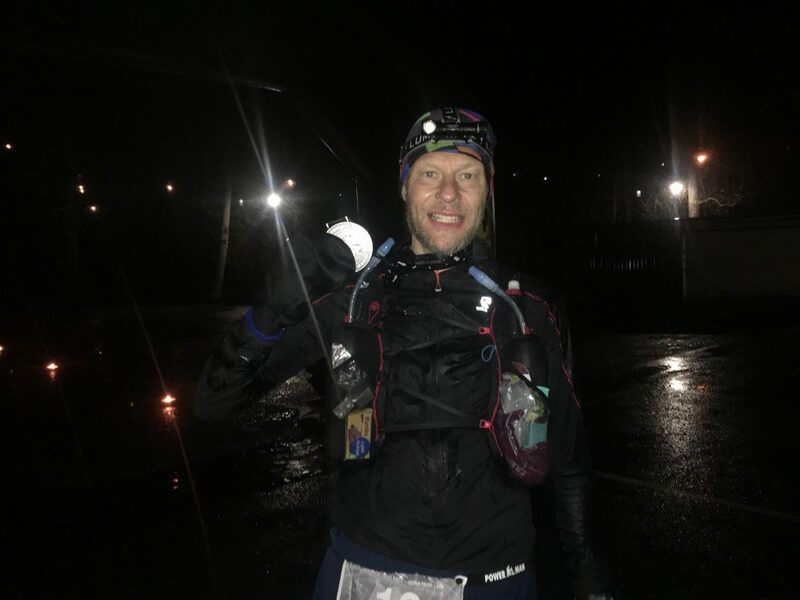 Fredrik checked in to CP7 with a time of 14h56m26, with Andreas keeping on the pressure, passing through almost ten minutes after. 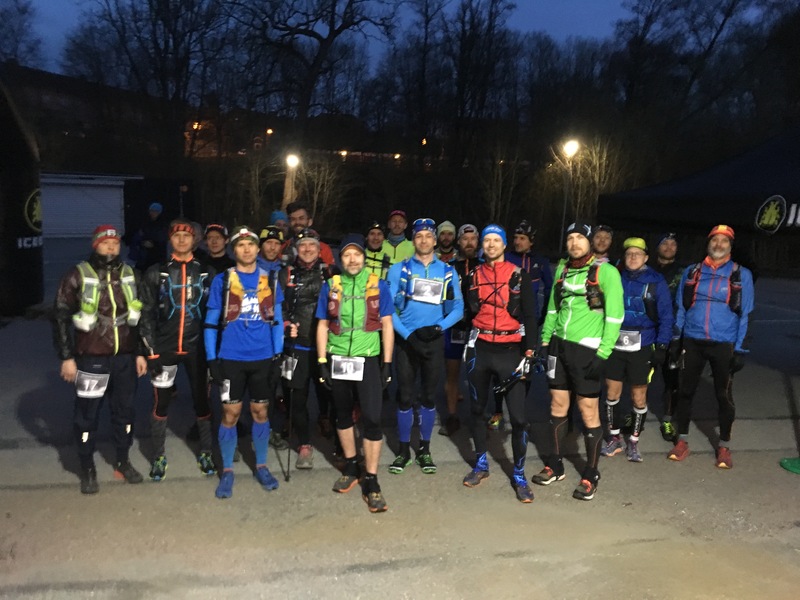 From Tulebo, the course returned to the Bohusleden trail once more, and followed it all the way to Skatås, with a minor detour over Hobo Hill, a popular spot for hill repeats for Gothenburg’s ultrarunners in preparation for alpine races around Europe. 90 demanding meters of elevation on this steep incline. Fredrik had hit the turbo switch by this point and reached the last aid station in Skatås in 18h01m, a full 40 minutes ahead of Toomas now. Andreas also experienced a second wind late in the race and was only half a minute behind Toomas on reaching CP8. The home stretch… 16km of hilly forest paths along the Bohusleden trail in the dark and rain. The Race Director waiting with great anticipation at the finish … Finally, just before two in the morning, light from a lone headlamp could be seen battling down the last descent towards the finish line. It was Fredrik, crossing the finish line in 20 hours, 50 minutes and 13 seconds. An amazing time on a track that many afterwards described as the toughest they had experienced in Sweden, up there with the renowned Kullamanen. 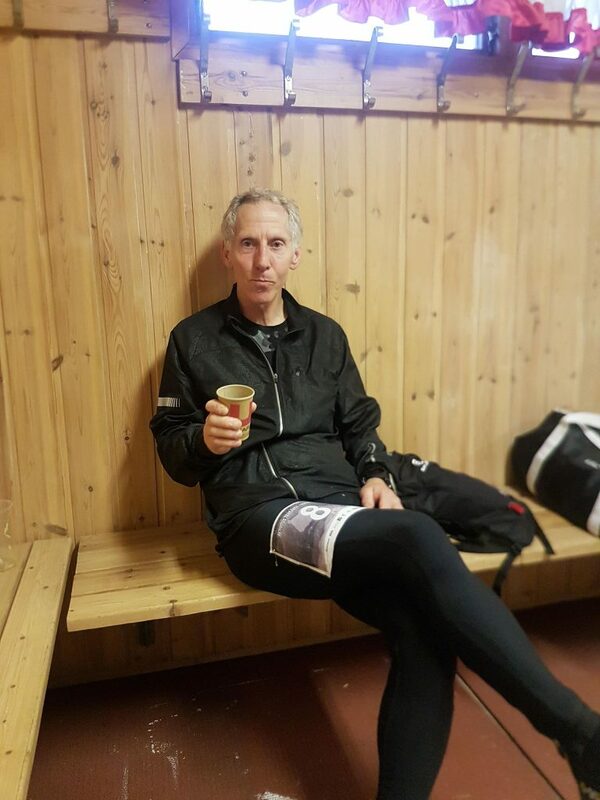 Fredrik Larsson was not only the first person successfully complete the course, he accomplished it in a fantastic time that also earned him the large silver medal for coming in under 24 hours. Toomas Unt from Estonia arrived 27 minutes later in second place at 21h17m40, with Andreas Pettersson in 3rd place fifteen minutes later at 21h32m24. Besides the podium winners, three more runners achieved silver-medal times under 24 hours – Andreas Simonsson, Sebastian Andersson and Daniel Pintaric. For Daniel, the finish was extra emotional, as had been a part of the inaugural race in 2017 and came furthest until a DNF after 130km. Finally, the sun rose and the rain stopped. Emotions were high. Family, friends, and supporters were waiting to cheer the runners across the finish line, many of whom had been out at the aid stations along the course throughout the day to offer support. Another 7 runners crossed the finish line well inside the maximum time of 30 hours, some had pacers for the last stretch, or had pacer support along way during the night. So, we can summarize the 2nd edition of the Aktivitus Trail Race 161k by saying that the course can indeed be run, and run fast. There was a general consensus that this was one of the finest courses they had run, with the added challenge of the terrain and hills. We may not have the highest mountains around Gothenburg, but to scrape together 4000 meters of elevation along a course where the highest point is 120 meters above sea level, gives you an idea of how many hills are involved.